The Figure Trimmer generates a natural aerobic workout by encouraging a twisting motion in your body. Twist your way to health, and have fun at the same time! The Figure Trimmer generates a natural aerobic workout by encouraging a twisting motion in your body. Stepping onto it while listening to music or watching TV makes exercise a pleasure. Enjoy yourself while your twisting motion melts away fat and trims your waistline. Both safe and effective, the Figure Trimmer does not produce any side effects, even with prolonged use. Unlike other such twist boards or discs, this Figure Trimmer&apos;s 200-some nodules stimulate specific meridian points on the soles of your feet to apply the benefits of acupressure. 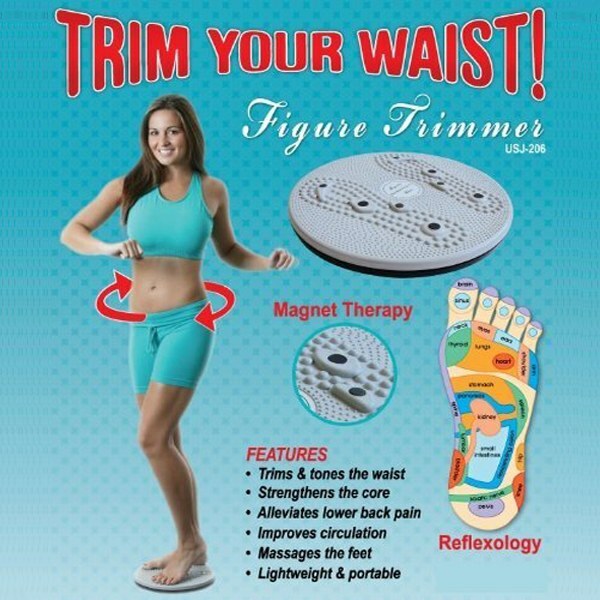 Strategically placed magnets throughout the disc add the benefits of magnet therapy. Naturally revitalize and restore fitness throughout your entire body! I use this to stretch out my lower back rather than a piece of equipment to help lose weight.